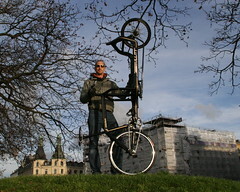 The Coolville Bullitt was promptly bought by Andreas, a bike messenger in Stockholm, after I wrote about it back in 2008. It is still grinding up the streets of the Swedish capital. Lettering on the frame intact. Nice. A little world premiere here on Copenhagenize.com. The world's first cool fixed gear cargo bike hit the streets today in Copenhagen. 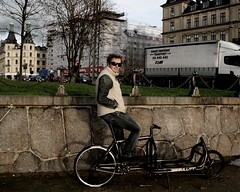 Larry vs. Harry, the Danish bikemaker, is growing from strength to strength on the cargo bike scene and their Bullitts are flying around the world. You're seeing more and more on the streets here but it is the bike messenger crowd that seem to have embraced the innovative Larry vs. Harry bikes. The fixed gear fad still buzzes at the moment - keep an eye out for the wobbly ones at the lights. But why not cater to those who fancy a fixed gear experience [and can actually ride them] AND who have things they need to move around? It's 'logic for chickens' as we say in Danish. The very best thing about this new fixie cargo bike is that it's called the Bullitt Coolville and Larry vs. Harry named it after me. One of my last names is Colville, which has become Coolville over the years. I thought Hans was joking when he said he'd make a Coolville but today I was thrilled to see the puppy. And not a little surprised to see that it was a fixie. THAT is irony if you follow this blog. So, I already have a cocktail named after me and now a bicycle. I'm going for a street next. By the way: A Coolville cocktail is 5 parts champagne, 1 part grand marnier, 1 part vodka and a big slice of orange. I'll be making one or many for Larry vs Harry at my earliest convenience. 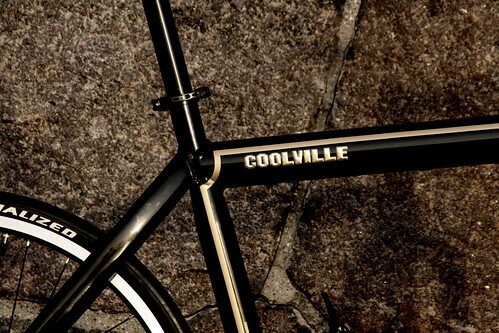 The Bullitt Coolville is a limited edition, of course. It's off to the National Museum quicksmart. 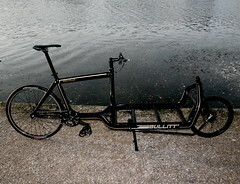 Larry vs. Harry, however, will produce a fixie cargo bike on request. Hans, from Larry vs. Harry. He's Harry. The bike is amazingly light. Only 18.9 kg. And like the other Bullitt family members it is a treat to ride. There is nothing like it on the market. Fast and furious. Smooth and cheeky. The steering was exceptional, too. 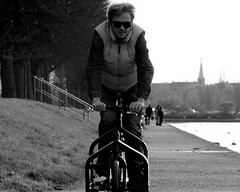 We went down to The Lakes to take some photos of it and I went for a quick ride - I had to pick up my kids shortly - and I was loving it. Here's a video by a bike messenger in the Netherlands, featuring the Bullitt in action. And here are Bullitts over Vienna, featuring some happy customers from Bikekitchen.net. Sure, sure, I like plugging my mates at Larry vs. Harry and Velorbis. But the only reason is that the guys behind these two companies are lovely, sweet people. I'll be honest and say that I prefer my Scrap Deluxe and my Long John - it's a personal style issue - but I love what Larry vs. Harry are doing, too. Both companies are cool, dynamic and marketing their products in bold, unique ways. Since wandering into this bicycle world with these blogs, I've discovered that the bicycle industry can really be a whiny place, filled with bitching and complaining. It's like this a little bit in Denmark, but it's a small country so you can't really step on each others toes and in many ways it isn't a part of the Danish mentality. Once you go international, on the other hand, you see some really nasty tactics. It's the exception, not the rule, but it really is quite childish sometimes. Not to mention fascinating from a psychological point of view. You can easily see car companies with all that bravado and macho attitude bitching at each other, but it's really strange to see it in the bike industry. Sometimes I'm pleased I'm just an observer on the sidelines. So I like the people behind Larry vs. Harry and Velorbis for the same reasons I'd probably like the guys behind the Metrofiets or Haley Trikes, among many others, if I ever met them. Good karma, a love of craftmanship and a firm belief in their products. That's all you need. Which is really what selling cycling is all about, as well as bikes. Blah, blah, blah... I have a bike named after me!!!! Cooltastic!